LA LA LAND: Field Trip to the Art Museum Reviewed by Patrick O’Heffernan on August 2, 2018 . Remember back in middle school when you went on a field trip to an art museum. The good part was that you got out of school and got to ride the bus with your friends. The bad part was…well, it was an art museum and you had to look at the art. Sometimes you even had to take notes about it and answer questions later. Everyone thought it was boring except for the smart kids and the ones who could actually draw stuff. Well, the field trips to the art museum are back, but they are now for adults and they are definitely not boring. Museums all over the country are breaking out with music – all kinds of music. From The Met and MOMA in New York, to the Smithsonian in the nation’s capital, to jazz at the Bechtler Museum in Charlotte, to the V&A in London, to a whole bunch of public and private galleries in Los Angeles, museums are hosting concerts to attract millennials. 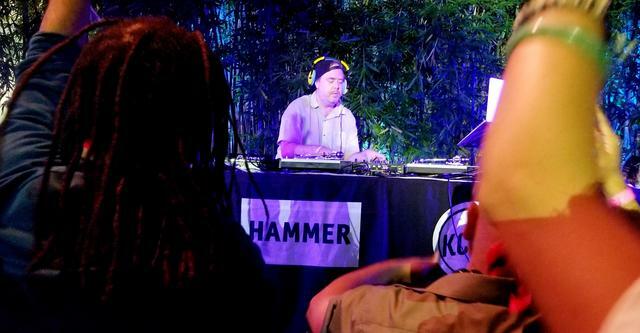 I have sampled these museum music nights in LA in the past – Dancing with Dinos at the Natural History Museum and Afro-pop night at the Skirball Museum, but I never thought I would see a museum turned into wild rave like The Hammer Museum was Thursday night, transformed by Buyepongo and DJ Cut Chemist. The Hammer, just a few blocks from UCLA, was founded by Dr. Armand Hammer, former Chairman of Occidental Petroleum Corporation and is actually located next to the oil company’s corporate headquarters. But, although it was founded to house Hammer’s collection of old masters, corporate it is not; it’s mission is to showcase art and artists who challenge accepted ideas and conventional wisdom to see our world differently and inspire social change. Hammer Director Anne Philbin is not afraid to address tough questions in the museum’s shows and programs nor to reach out to parts of society that normally don’t stroll through art museums. One of those efforts is the admission-free KCRW Summer Nights at The Hammer, a program of edgy music programmed in several LA cultural institutions by radio station KCRW and featuring bands ranging from rock and roll to electro-pop to Mariachi to the latest in jazz. Thursday night’s Summer Nights program meshed with the other current Hammer outreach, Made in L.A. 2018, a museum-wide exhibition of artists working in LA on contemporary themes now roiling LA culture. Drawings, paintings, sculpture, textiles, video, photography, and installations by LA artists from 29 to 97 years old are spread throughout the Hammer. Thursday night the crowd was not there for the art; they were there for the music The Hammer’s interior courtyard was filled with maybe as many as 1000 screaming, gyrating, clapping, dancing fans of all ages, moving to the vibrant polyrhythmic sound of the LA-based Buyepongo and the trippy beats of the one and only DJ Cut Chemist — a swirling mass of happy people. Folks began trickling in around 5 pm to stake out prime spots as DJ Anthony Valadez spun Latin dance numbers, mixing, sampling, and scratching while people filtered in from the food trucks and onto the dance floor in front of The Hammer’s stage – built and operated by the same team that works Coachella’s stages. 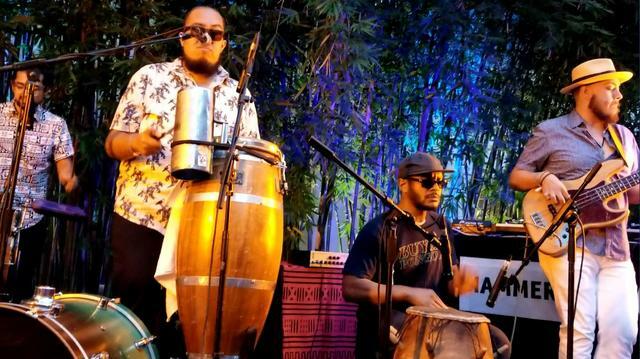 The bars in the back of the courtyard opened at 7, giving everyone a half hour to start the buzz before Buyepongo filed on stage, plugged in and frontman Edgar Modesto, started scraping the güira lashed to his conga(a combination he calls a Congüira) and launched into Al Regressar. The party was on! and the fan trickle became an avalanche packing the dance floor and the lines to the bars and Food trucks. As the sun went down and the strobes flashed the crowds, Buyepongo ramped up the tempo, fusing cumbia, merengue, punta, jazz and funk in a wild pulsing dance rhythm, giving us 11 songs and finishing with their popular Las Viejas. The lyrics were all in Spanish, although the conversation from the stage was English. At one point between songs Edgar stopped, looked over the multi-colored, multi-racial, all-ages crowd in front of him and said, “I don’t care what they say in Washington D.C., this is what America looks like”. The cheer could be heard all the way to UCLA. Buyepongo wrapped up but the line outside did not. Folks were still coming in as DJ Anthony Valadez took over and moved the DJ rig to front and centerstage and started spinning. The crowed now spread up the stairs and onto the balcony as people used the break to explore the galleries or take selfies with Carolina Caycedo’s beautiful fishnet mobiles, To Drive Away Whiteness and Cosmotorrayas, hanging over the courtyard/dancefloor. By the time Cut Chemist mounted the stage, unpacked his vinyl, and inserted his needles, The Hammer looked more like Vans or SXSW than an art museum. Cut Chemist has been recording and performing for nearly 30 years. Djing at age 11 and recording at 14 in the 80’s, becoming a founding member of both the rap group, Jurassic 5 and the Latin funk band, Ozomatli in the mid-90’s so his popularity crosses all ages. Among his many recordings, he has produced one of the world’s most sought after mix cd’s, Brainfreeze. He now broadcasts a weekly radio show but he only has three live shows listed for the remainder of the year so the opportunity to see him drew people from all over. The crowd he drew was heavy millennial, but many sported gray hair and memories of Cut Chemist in Ozomotli and Jurassic 5. Kids on their parents’ shoulders or teens dancing hip hop nailed down the other end of the age spectrum. Cut Chemist’s samples were mostly English but the beats occasionally zipped into Latin polyrhythms, inspiring disco moves from jump to salsa. But whatever the music, the capacity crowd moved as a single organism while Cut Chemist conducted them. Best field trip to an art museum ever!